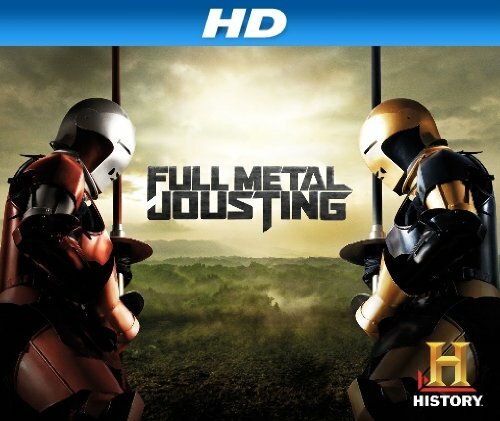 Quick Take: Full Metal Jousting, "The Ultimate Extreme Sport"
Review: Full Metal Jousting, "The Ultimate Extreme Sport"
(S0101) So, the History channel decided to create something that doesn't involved trucks or the pawning of old junk. The name Full Metal Jousting sounds pretty entertaining and for the most part the show delivered. It follows a formula very similar to Top Shot, another one of my guilty pleasure shows. I tend to get giddy at the mention of renaissance anything, so this show certainly appealed to me. Do they take it a bit over the top and over dramatize the action? Of course they do, but really we should come to expect no less. We start off by meeting our host/guide for the show, Shane Adams. Then we are introduced to our 16 competitors who are split into two teams, the red team and the black team. Side note, the black team's colors, black and gold, look way cooler than the red teams, just throwing that out there. Each team is assigned a coach who are world champion jousters. Alright, I know what you’re thinking, because it's the same thing that went through my head. How are there would champion jousters when I've never even heard of any jousting competitions? Well, evidently there are and these guys take this stuff to a whole new level. So, for entertainment's sake, I'll ignore the fact that I've never heard of champion jousting matches later than the 15th century and roll with it. As with many shows in this realm the competitors are taken to their super, awesome hang out spot, where drama will no doubt be afoot. The armor that they designed for the competition is a pretty cool hybrid between classic medieval and Iron Man (the super hero). The idea behind the show is that each episode we will get to see team drama (of course) and them preparing for a joust. The last portion of each episode is dedicated to showcasing a joust between each team. The winner earns mad jousting rights and loser is beheaded, just kidding, he's only eliminated from the competition. The final winner will earn 100,000 gold pieces and be declared king for a day, or something like that. I also learned that jousting has far more rules that I previously thought. I mean we've all seen A Knight's Tale so we understand the basics. A glancing blow on the Gran Guard (shield zone) will earn one point. A broken lance will earn 5 points and unhorsing an opponent is worth 10 points. But did you know that any strike on any part of the rider or gear in the shield zone is a point? Or that a head shot is minus 3 points. Or that if the lance tips strike it's a mulligan for that round? Yeah, me either, but it does add to the excitement and intrigue of the show. So everything leads up to two jousters going head to head on 2000lb war horses, not sure which war these horses were bred for, but again, let's just roll with it. This episode Josh from the black team faced against Mike from the red team. I have to admit (perhaps it's my inner renaissance geek) that the competition was pretty entertaining and by the end I was cheering at the TV. But after many harsh rounds Josh was successful in claiming victory for the black team. In my opinion there is too much talking between each round, however, it did increase the suspense I suppose. Twas a very good joust indeed. All in all I think the show has a solid feel to it and I'll give it credit for being unique. It definitely has the reality jousting category locked down. I'm excited to see what they do with the show as far in-between material. Since half of the show is dedicated to the jousting match I feel that first portion of each episode is really going to set the tone for lasting entertainment value. I was hopping for more chipper medieval music, but over all I did enjoy The History Channel's new reality competition and will be tuning in next week to see how things progress. Great to see you back in action, Jaron ! I enjoyed it too, even if the whole idea got a big goofy from time to time (southern twangs associated with a traditionally English/medieval undertaking just seems a bit odd, you know?). Still, I really wonder if this show will hold much interest over the long jausting haul.